Depicting a standard cycle of the Passion of Christ, the words ‘Ecce Homo’ (‘Behold the Man’) were used by Pontius Pilate to present Christ to the jeering crowds before his crucifixion. Mary swoons in the foreground, an unusual addition to the scene, as her presence goes unmentioned in the Gospel (John 19: 2-5). Pilate can also be seen, wearing a turban. 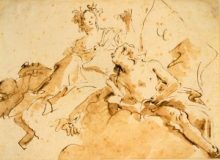 Carracci’s representation encapsulates the poignancy and solemnity of the narrative. 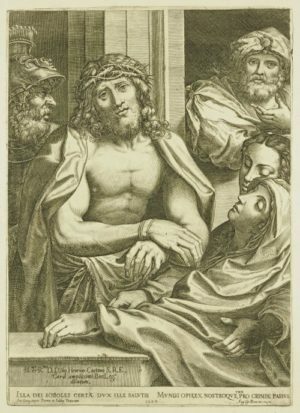 The engraving is almost the same size as Correggio’s painting in the National Gallery, London, on which it is based.